Jonah Hex: No Way Back is a milestone for the gruff bounty hunter headlining DC Comics’ only ongoing Western. With his own series now past 60 issues, this is the character’s first Original Graphic Novel. While obviously benefiting from the publicity surrounding the film (and probably intended as a bit of an introduction to the character) the book ties heavily into Hex’s history and previous storylines. It’s best enjoyed near the release date in our reading order – coming right after Jonah Hex: Counting Corpses, which collects issues up to June 2010. The book references specific events in at least three of the preceding collections and broadly builds on most of the others. That being said, Hex’s adventures aren’t related in chronological order and readers may not mind piecing his life together on their own. 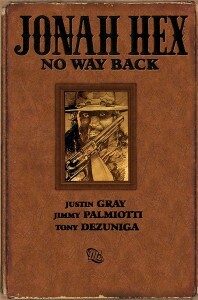 No Way Back is certainly an important volume, though, because it ties up more than one important plotline and introduces some previously unknown elements into the dusty tapestry regaling the legend of Jonah Hex. The 136 page story is spun by Jimmy Palmiotti and Justin Gray, the same writers who have steered the entire modern ongoing. It’s not possible to really discuss this book without some spoilers, so if you are trying to avoid them, you might want to skip to the verdict now. The story, obviously longer than your average done-in-one single issue, concerns Hex’s reunion with his long gone mother. This book finally explains their initial parting and brings that chapters of Hex’s life to a firm close. In doing so, though, it opens up another can of worms – Hex has a brother. Well, a half-brother anyway. The meat of the book concerns this particular discovery and the new character’s interactions with our gruff protagonist. The tale is told with the writers’ usual quality, though perhaps with a tad less brevity. 136 pages allows for gentler pacing, after all. The dialogue is extremely enjoyable, with an air of authenticity and sharpness of wit. In no time did I feel this was more dumbed down modern Western – the word usage and timely colloquialisms sometimes took a slower read to fully appreciate, but it was well worth it. At least one interaction sparked a round of full out laughter, something very rare when I’m reading on my own. 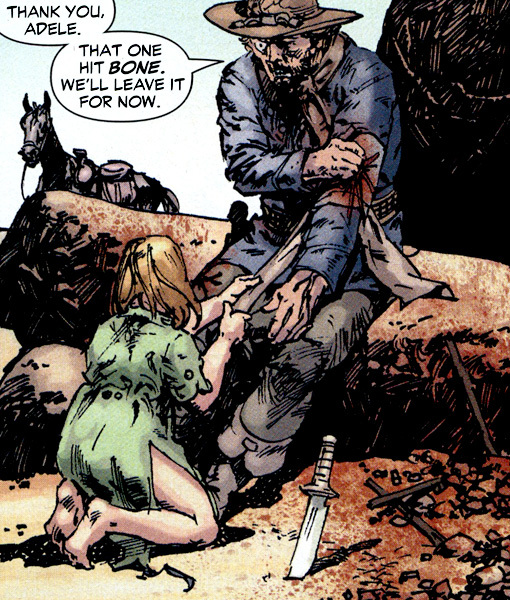 Also, while there is a moment of brilliance where a town being warned of attack doesn’t act like a bunch of ignorant idiots, laughing off the danger and spurning their would be helper (a cliche badly overused and thankfully avoided) they do then turn on their protector and offer him to the villain promising safety for them. One trope avoided only to fall prey to the next. Unfortunate. There’s a few other moments that just feel awkward, and altogether the plot didn’t feel like it taught me more about Hex than many of the much shorter stories. These issues keep the book from its full potential as a true classic. Likewise, the art has moments of greatness but didn’t live up to my (admittedly quite high) expectations. Tony DeZuniga is still my all time favorite Jonah Hex artist, but his work felt inconsistent here. Granted, he was 69 years old when this book was completed, but Joe Kubert blew me out of the water with his Tor work at the age of 82 so maybe I shouldn’t be so ageist. It’s not that his style has changed so much – scratchy and dirty, suggestive with sometimes melty faces and very generalized hatch lines. I like that. I’m impressed by his evolution from the almost house-style DC work he was doing in the Bronze Age, as impressive as it was. It’s great that he’s comfortable taking more risks and his stylistic choices here fit the title perfectly. And his forms feel a lot stiffer than they have in previous works, including his other art for the modern run in Face Full of Violence and Guns of Vengeance. Those two stories include some really amazing work, though, so perhaps it’s a lot to expect that quality consistently over 136 pages instead of 20. Also, to be fair, some of the problem might be the coloring, which also isn’t quite as good as it has been during the ongoing. It’s still Rob Schwager, who I’ve praised profusely in the past (and deserves it), but perhaps the team was up against more problematic deadlines with this book, which was completed on top of their usual monthly schedule. The palette is familiar, but the finishing just lacks much of the suggestive texture I’ve come to expect in this title. You may want to compare to the last teaming of Schwager and DeZuniga, which was really something. In any case, lest I’ve started to dissuade you, I need to stress that a medium-level showing from this team still makes for a book worth buying. 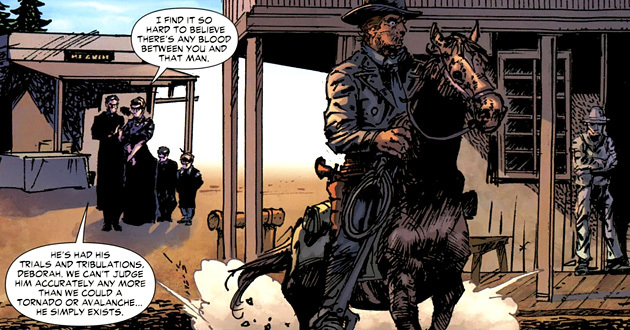 While it has some small problems, Jonah Hex: No Way Back is still essential for any fan of the character. As a bit of a bonus, it’s beautifully packaged. The hardcover edition is shipped without a slipcase (thank god, they always get scuffed and damaged, totally useless) and is an embossed faux-aged affair with tight binding and pleasingly textured endpapers. The paper is glossy, and while not particularly heavy weight, solid feeling. If I have any complaint about it, it’s that the art tends to slip into the gutter a bit, making me wish the book was sized wider with a black margin in the middle. I’m glad I jumped on this purchase and got such a beautiful looking hardcover. Usually I wait until the softcover release, but I really would have been missing out here. 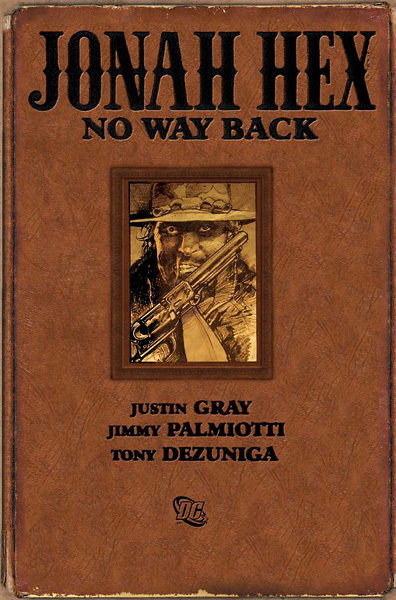 It may not be my favorite Jonah Hex book (a title still held by Luck Runs Out, with Showcase Presents a very close second) but No Way Back is a welcome addition to my shelf. 3.5 out of 5. Possibly because of my high expectations coming into this wonderfully presented hardcover, I was a tad disappointed with the actual story. However, the dialogue and pacing is still great, with moments of absolute brilliance and events that are sure to have Hex fans arguing across various forums. There’s no way anyone interested in the character should avoid this one, but it’s not my top pick or the ideal introduction for a new reader. 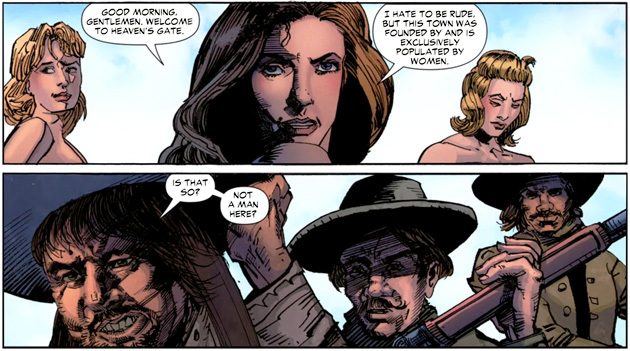 Yes, this book is essential for Jonah Hex. Like the all of his books, while it takes place in the DC Universe, it’s not essential reading for any event or other title. 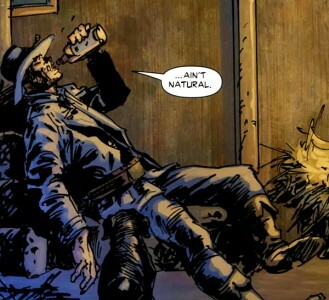 The contemporary series has been collected in Jonah Hex: Face Full of Violence, Jonah Hex: Guns of Vengeance, Jonah Hex: Origins, Jonah Hex: Only The Good Die Young, Jonah Hex: Luck Runs Out, Jonah Hex: Bullets Don’t Lie, Jonah Hex: Lead Poisoning, Jonah Hex: The Six Gun War aaaaaaaaaand Jonah Hex: Counting Corpses. Some of those other trades have additional recommended reading. 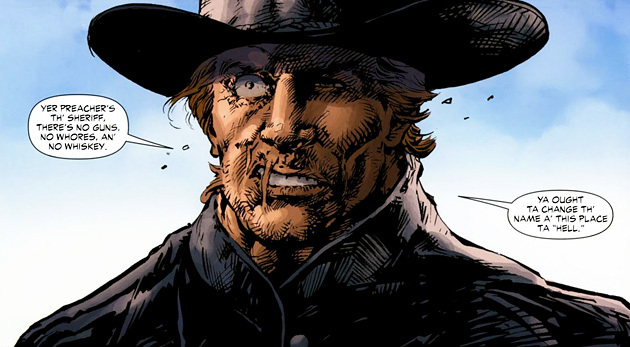 Following along with the DC Comics Reading Order, the DC Westerns and Jonah Hex‘s own list, the next book will be Jonah Hex: Tall Tales, which won’t be released until May 2011. We’ll be sure to check it out once it’s on the shelves! 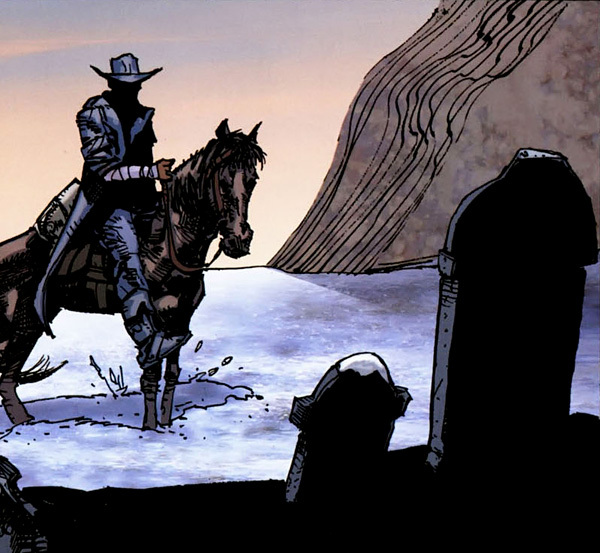 That means that this concludes (for now) our journey through the DC Westerns. I’ll do a wrap up post soon! If you can’t get enough of westerns in general, there’s always the Marvel Westerns or titles like Blueberry, which I’d like to get into at some point. If you’re journeying with me through the DC Universe, you’ve probably noticed that I’ve already stopped off at Enemy Ace and Doc Savage and am already working through Sandman Mystery Theatre. Is there anything extra in the HC at all? No, just a small creator bio page and a couple endpapers with reprinted panels. If you wait a bit, the hardcover seems like it will go down in price. It’s already at 10 dollars used. While it doesn’t have extra contents, it really is a nice feeling and looking production. Maybe the softcover will be easier to see with the gutter, though. The embossing is really tastefully done. that I understand. I have it right before the golden age bookshelf so there are a lot of mixed hard and softcovers there. But most of my DC books are softcover too. which do you mean? Most prestige books are of standard comic issue dimension. Son of the Demon is a prime example, but there are others like Killing Joke, Endless Nights, etc. Some might be just be the UK publications. perhaps, though killing joke has been published so many times in so many different formats that it’s possible I missed an oversized one. Mine is standard prestige format. Endless Nights is a much thicker ogn, I think, though I know what you’re talking about – it does poke out a random inch or so. I was really not interested in Hex before, plus tack on the poor publicity of the movie which I’ve been instructed to avoid, but your continued reviews have really peaked my interest and I’ll be picking up a hex trade soon per your recommended reading order. Thanks! Good to hear! Definitely start with one of the bronze age ones of the first trade of the ongoing, Face Full of Violence. wow, really? That kind of random inflation is exactly why I include links to a few different sources – the ones that are easy to automate by name and isbn number, anyway. hehe, Adventures is light on continuity, but I totally understand you there. Sorry about having to start the giveaway with vol. 2 – it just happened to be the book I was able to find in a huge lot! yeah, I’m such a jerk. I’m actually surprised you gave this such a low rating. I have been purchasing the monthlies of Jonah Hex since back in 1978, and haven’t missed many issues of the old run, and none of the new. Alas, with my own high expectations of this release, I still found it fantastic. The origin of Papagayo was the only thing i found “wrong” with the book. Totally out of character, I thought. Aside from that I truely found the pacing, the script, the dialogue etc. all engrosing. I had many laughs, many sad moments. Finally I came away from the book knowing i got my money’s worth, and loving it. I, personally, found no real issue with the art, and loved seeing Tony’s work again. In short, it was gritty, and realistic. I would give it a 4.5 of 5, due only to the Papagayo origin. Absolutely, and I’m glad you took the time to share yours as well. I always hope people take into account the opinions of more than one reviewer. There will always be differences, like you mention, and the most we can do is be true to our own feelings and honest about how we came by them. Take some time and do a “re-read” and see if you feel the same way. You may find that if this were your first HEX book you may come away feeling a bit more inclined to give a higher rating. And that’s what it’s all about, right? This book on it’s own merit? Each book as it is presented? (though i would have to give on the Papagayo origin, given this scenario). How you’re represented? Have you got a cameo in Tall Tales? As stated per an earlier post here I am represtnted in “Tall Tales”. I am (not pictured, but mentioned in name) as being the person telling these “tall tales” in the upcoming trade. The “MR. Davis”. Palmiotti himself says it was a “nod” to me. As a long time reader and poster. This as well as upcoming character in American Vampire. Which i was to submit a review to you for first trade, but i cannot as i feel it would be too “spoiler ridden” (see posts from the AV boards). Not only myself, but later as “gang” in the comic. Of Jonah Hex. I’ll definitely be on the look out for it. It’s a shame the next book doesn’t come out for so long. Nice review. I agree with you about the art… my initial impression upon reading the book was that it was perhaps too much work to do at one time at this stage of his career. The anatomy seemed to get increasingly “off” as the book progressed. I don’t know if it was all done sequentially, of course, but if it was then my theory might be close. I love Tony’s art and he is and will always be THE Hex artist, but as you point out these inconsistencies aren’t there nearly as much on the shorter stories. I mean, I don’t remember Hex looking a horse straight in the eye while standing next to him before! All that said… great book and highly recommended. Thanks for the comment, Otis. I think you’re probably right. Perhaps they were trying to rush it onto shelves before the movie hit. Hopefully DeZuniga will get a change to carefully work through another Hex epic – I’d love to see more OGNs from him and the Js. Hello there, just became alert to your weblog thru Google, and located that it is really informative. I am going to watch out for brussels. I will appreciate if you happen to continue this in future. Numerous people can be benefited from your writing. Cheers! information right here in the post, we’d like work out more techniques on this regard, thank you for sharing. . . . . . Your means of telling everything in this piece of writing is actually good, all be capable of without difficulty know it, Thanks a lot. Үour ѕtyle is so unique compared to other folks I’ve read stuff from.
) I am going to revisit yet again since i have saved as a favorite it. Rajarshri Solution is an established Professional Web Development Company Who delivers Web & Software Development and Website Design Company in Vadodara, Gujarat, India . Worldwide clients complexity can be solved through this company. The company has been in IT business for 2 years & so it has now a strong team of skilled and experienced IT experts. The company has customers which are companies of all sizes ranging from Fresher to large enterprises who have the knowledge that they need a professional IT solution to generate revenue streams.